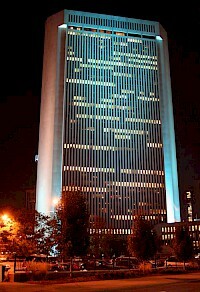 The Motorists Mutual Building is a 286ft (87m) tall skyscraper located at 471 East Broad Street Columbus, Ohio. It was completed in 1973 and has 21 floors. It is the 18th tallest building in Columbus. One Columbus Center is a 366ft (112m) tall skyscraper in Columbus, Ohio. The cornerstone for the 26 floor building was laid on October 21, 1986, and it was completed the next year. NBBJ designed the building, which is the 11th tallest in Columbus. The staggered facade allows for 15 corner offices on every floor. It has 37,855 m² of floor space, and sits on the former site of the Deshler Hotel. 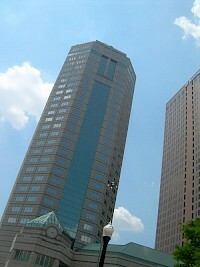 One Nationwide Plaza is a 40-story skyscraper in Columbus, Ohio that is the headquarters of Nationwide Mutual Insurance Company. It is part of the complex of buildings known as Nationwide Plaza. Nationwide outgrew its famous 246 Building by the 1970s and work began on a new headquarters for the company. In 1977, the 146 m (485 ft) building was completed. The building is located at the corner of N. High Street and what is now Nationwide Blvd. on the northern edge of downtown Columbus, Ohio. The James A. Rhodes State Office Tower is a 629-foot (192 m) skyscraper located in Columbus, Ohio. 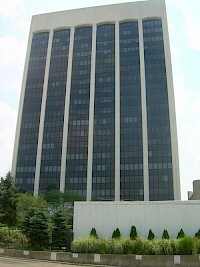 The Rhodes Tower was completed and occupied in 1974, and is currently the tallest building in Columbus. Currently, approximately 4000 state employees work in the building. Construction costs totaled approximately $66 million. It is named after Ohio's longest serving governor, James A. Rhodes. 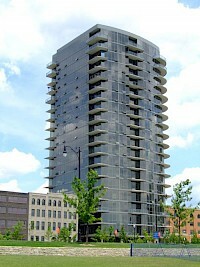 The Condominiums at North Bank Park is a 267ft (81m) tall high rise in Columbus, Ohio. It was constructed from 2006 to 2007 and has 20 floors. The 20th tallest building in Columbus was designed by 360 Architecture and developed by Nationwide Realty Investors. 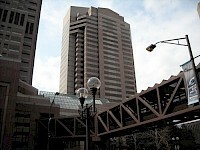 Three Nationwide Plaza is a 408ft(124m) postmodern highrise building located in Downtown Columbus Columbus, Ohio. The building is part of the larger multi-building complex known as Nationwide Plaza. 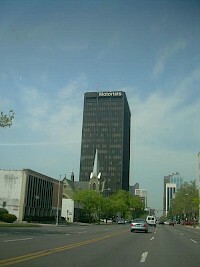 Nationwide Plaza is the headquarters of Nationwide Mutual Insurance Company. 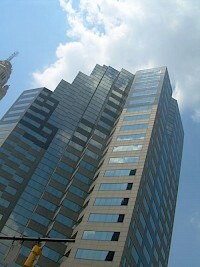 Three Nationwide Plaza is the 10th tallest building in Columbus. Construction on the building finished in December 1988. The architect responsible was the NBBJ Group. 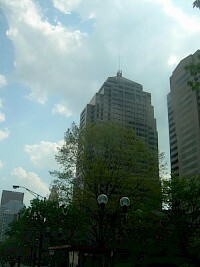 The Vern Riffe State Office Tower is a 503ft (153m) tall skyscraper in Columbus, Ohio. It was completed in 1988 and has 32 floors. NBBJ designed the building, which is the 5th tallest in Columbus, and has 102,192 m² floor area. An eariler idea for this site, also by NBBJ, would have included a site to the west of the present location, and would have effictivley closed off South Wall Street north of West State Street. 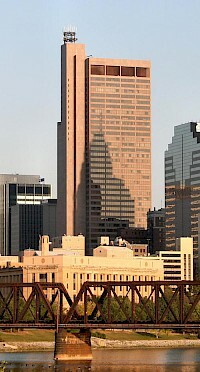 The building was named for Vernal G.
The William Green Building is a 530ft (162m) tall skyscraper in Columbus, Ohio. It was constructed from 1987 to 1990, and was topped out on June 8, 1988. It is the 3rd tallest building in Columbus and the tallest constructed in 1990's. The low rise wing that extends to North High Street is constructed on the former site of the Chittenden Hotel.